Issues of due legal process and access to justice in Iran came under scrutiny at a high-level seminar, on 9 May, organised to mark the fifth anniversary of the arrest of Iran’s seven former Bahá’í leaders. Held at the Law Society of England and Wales – and co-hosted by theBar Human Rights Committee – the seminar attracted more than 50 practising barristers, solicitors and human rights lawyers. The seminar heard how the trial and sentencing of the seven Bahá’ís to 20 years in prison each, was conducted under proceedings that violated international and national Iranian laws. 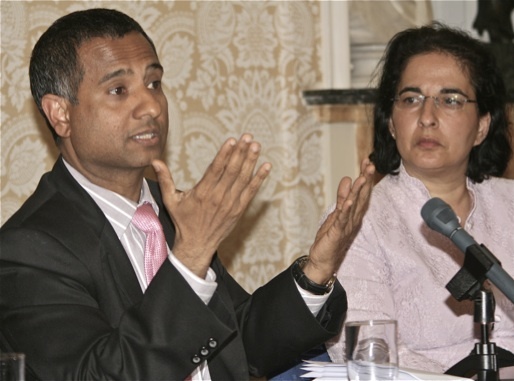 The case can be seen as a major example of wide scale abuses in the Iranian justice system, used as a tool of oppression against religious and ethnic minorities, human rights lawyers, activists and others. Coinciding with the seminar, a letter signed by 18 prominent UK human rights lawyers was published in the Telegraph newspaper. The trial of the seven, “violated national and international laws as well as shariah norms,” they wrote. Signatories to the letter included Sir Desmond de Silva, Cherie Booth CBE QC, Lord Lester of Herne Hill QC, Lord Macdonald of River Glaven QC, Michael Mansfield QC, and Professor Philippe Sands QC. 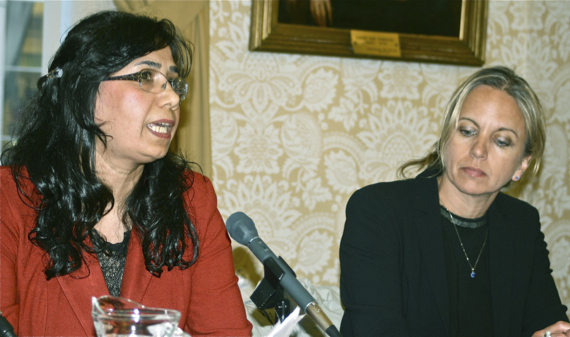 The history of the case of the seven – who formed an ad hoc group that looked after the affairs of Iran’s 300,000-strong Bahá’í community – Iranian human rights lawyer Mahnaz Parakand (left), with Kirsty Brimelow QC, chair of Bar Human Rights Committee was outlined by Mahnaz Parakand, the Iranian lawyer who defended them and herself fled Iran in 2011 fearing execution. Detailing the blatant disregard of due legal process in their case, Ms. Parakand recounted how, among other procedural violations, the seven prisoners were deprived of any meeting with their legal representatives for the first two and a half years of their incarceration. She also noted how the particular official dealing with them had a dislike for the Bahá’ís. “And this actually meant that the way they were dealt with did not follow correct legal procedures,” she said. “Having studied their case, it was clear that there was no basis for the allegations that had been brought against them,” Ms. Parakand added. Dr Ahmed Shaheed, the United Nations Special Rapporteur on Human Rights in Iran opened the seminar. “When we look at the case of the seven Bahá’í leaders, we see the hallmarks of the legal issues faced by the Bahá’ís and other minorities in Iran. They are frequently subject to unfair trials and persecuted.” Dr. Shaheed stressed the importance of documenting cases, highlighting those who abuse human rights, and supporting workers for justice in Iran. Dr Nazila Ghanea – a lecturer in international human rights law at the University of Oxford – outlined a number of specific violations of due legal process exemplified by the case of the seven. These included the non-independence and partiality of the judiciary; a lack of transparency towards the accused, their lawyers and their families; and the hampering of the efforts of their lawyers who defend them, even by threat of imprisonment. The seminar – which was chaired by Kirsty Brimelow QC, Chairwoman of the Bar Human Rights Committee and a leading international human rights barrister at Doughty Street Chambers. Six of the seven were arrested on 14 May 2008 in a series of early morning raids in Tehran. The seventh had been detained two months earlier on 5 March 2008. The seven are Fariba Kamalabadi, Jamaloddin Khanjani, Afif Naeimi, Saeid Rezaie, Mahvash Sabet, Behrouz Tavakkoli, and Vahid Tizfahm. Today they are enduring harsh conditions in two of Iran’s most notorious prisons. The five men are incarcerated at Gohardasht prison in Karaj, a facility known for its overcrowding, lack of sanitation, and dangerous environment. The two women are held at Tehran’s infamous Evin Prison.